The church celebrates Candlemas this Sunday. It's the day that the baby Jesus was officially presented at the temple and Mary was ritually purified after His birth.Candles are lit and blessed. Here in France, it's called Chandeleur and has become a mostly secular day of eating crepes and fortune-telling. If you're an ancient Celt, a druid, or a wiccan, you may know this day as Imbolc...the quarter-day mark between the winter solstice and the summer equinox. In many cultures, it's celebrated as the first day of spring. Whatever your beliefs are about this day, there's no denying that change is in the air. The hard winter is passing; the new growth of spring is beginning to rumble deep in the earth. For that reason...and for crepes...and for baby Jesus and his mom, I lit a candle today in church. I went to a mass, following the week after the funeral, of a young farmer. The mass was full, standing room only, including the balcony portions and EVERYONE had a candle…so beautiful. 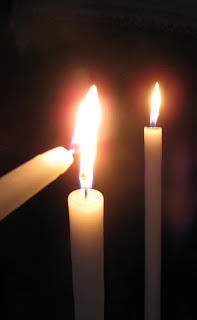 I know the mass the week after a funeral is customary…I had not understood the candles, including those whom later had ventured graveside, after the mass. It is now clear. I find this type of devotion for death (and therefore life!) particularly beautiful and profound. There was someone representative of each and evry household in the valley. I find this type of tradition particularly serene and enhancing with a sense of security.